Playing with your friends, winning games and having a great time doing it … all signs that indicate Bronco league baseball is back in Hamtramck. Led by first-year Head Coach Tom Habbitz, the Hamtramck Broncos are off to a winning start for their season with a 5-1 record in an independent league. Habbitz is accompanied by two assistants: His father, Tom Habbitz Sr., and friend, Gjeto Gjelaj. Habbitz is a resident here in Hamtramck and works for the Henry Ford Health System. He originally wanted to be an assistant, but once he heard the head coach job needed to be filled, he knew he was the right guy for this position. “I just wanted to teach kids the fun of learning a new game like baseball. And so far the kids have accomplished beyond expectations with the dedication they’ve shown, the commitment, and the fun they’re having day in and day out,” he said. 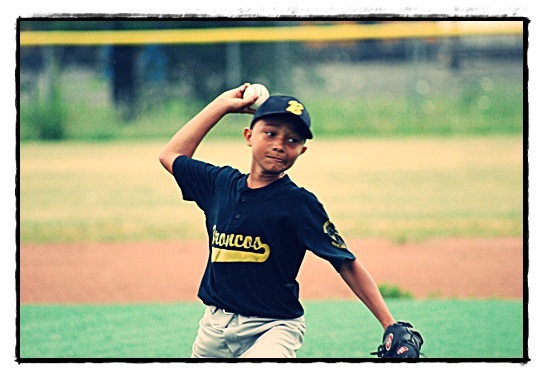 The Hamtramck Broncos are made up of players from different ethnic backrounds –players like Jusuf Muhic, a Bosnian catcher, Myran Winnbush, an African-American pitcher, and Hamza Alhadali, an Arabic infielder/outfielder. You might think it would be tough to coach these kids a sport they are not accustomed to, but it’s been a joy for coach Habbitz. What a great story and photo! We need a “Like” button.